I guess I've been chicken - I've been showing you very selective areas of the house...the "good." I guess we need to get to the bad and the ugly. Here's the kitchen wall that's on the back of the house. That's not op-art on the walls. Those are 12-year-old unpainted sheetrock walls...a project started with my husband, and never finished when we split. We moved a doorway, moved around the appliances, replaced a window. It's a very awkward arrangement. The base cabinets to the left (photo left) of the stove are barely usable as the doors won't open all the way, and you're like behind them as you open them. I do love my big glass door so I can see out. And the half door on the right is to the pantry. I found that big orange painting in someone's trash. It has a little water damage on the bottom, but I love it! 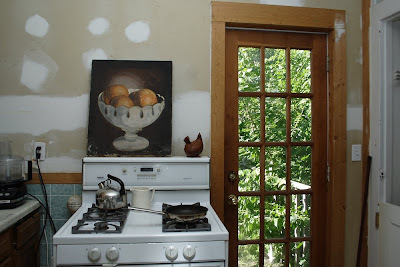 The kitchen definitely needs some TLC before I list this house next year! and I love your back door - that's the kind I want. Lauren dear, a) no, will not be painting this week - probably not til spring, and b) what's with all the messages?? ha! I think cookiebabe really wants to know-hehe. I like how you are showing us everything. you are right the painting is beautiful. I love that painting too.